When it comes to home security, peace of mind and convenience are what matter to me, making a smart lock pretty damn appealing. We know that homes generally aren't targeted by burglars for a lack of obstacles, but for an abundance of opportunity (like an unlocked door! ), and a smart door lock leaves one less thing to chance when you're away on vacation or at the office. All the locks in the world probably aren't going to stop someone truly determined to break into your home - so unless you're barring your windows and using solid exterior doors (and most US homes aren't), I don't think the physical security argument has many legs to stand on. A visible security camera and some background music will do far more to deter a break-in than a Medeco deadbolt. 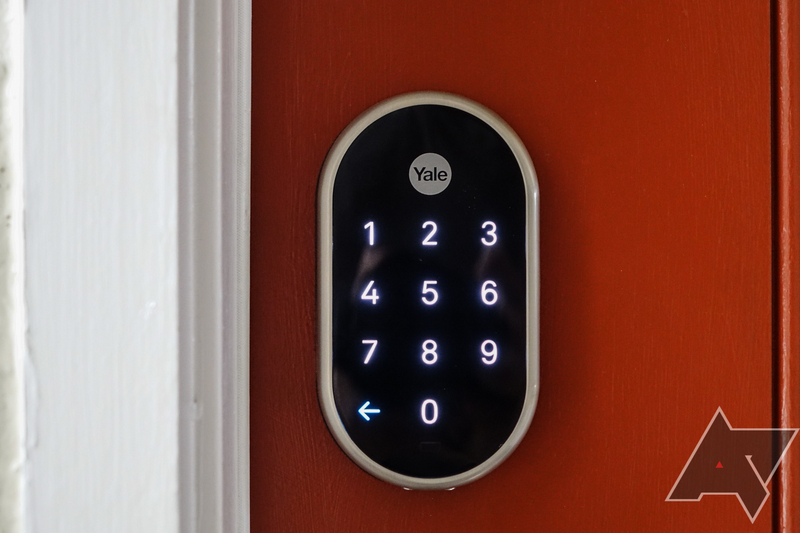 I've been using the Nest x Yale lock in combination with the Nest Secure system in my home for the last week, and I think that, while very costly (this setup, in total, retails for $649 - but you can get the lock and a Nest Connect standalone for $279), I'm converted: this technology seems ready for most people. That doesn't sound like a ringing endorsement, I know, but I'm pretty conservative when it comes to smart home gadgets. I wouldn't even recommend my $30 WeMo Mini smart outlet (generally considered the top pick in this category) to anyone. It works, but the setup process is beyond lamentable, and it doesn't always work reliably. And I don't even want to consider how secure a WeMo Mini might or might not be. The Nest x Yale lock is a comparative breath of fresh air. The Nest app makes setting it up simple - mostly - and managing it is largely straightforward (though I'd argue Nest really could afford to cut down on the Secure settings). I also think that the Nest Secure used in combination with the lock is a compelling experience, though there are some speed bumps I encountered, and I'm not entirely convinced the Secure is going to provide anything close to $400 of value for most people. It's just too expensive for what it is. But the $279 standalone door lock setup is probably fine for most of us, especially if you've already got a home alarm system you don't want to replace. It's also something basically every home can make use of - not every house has a thermostat (or even central air), not everyone needs external security cameras, and apartment renters generally are discouraged from making many modifications to their units. And, admittedly, that's an area where smart door locks are still going to pose an issue - you'll probably need to ask your landlord for permission, and there's no guarantee they'll say yes. But every home has a front door lock, and the vast majority of American homes use one of two standard deadbolt cutouts, either of which the Nest x Yale is designed to work with (in my case, installation was completely plug and play - I just provided the power drill and a screwdriver). And much of the beauty in the Nest x Yale is the lack of fluff features: basically everything it does is useful and serves a pretty obvious purpose. And when you're talking about something as personal as managing the entrance of your home, that's not an easy expectation to live up to. You can lock it via the app, twisting the bolt (from the inside), or by pressing the Yale logo on the keypad (this can be disabled). It allows you to set guest codes, and those codes can be configured to only work during certain hours and can even expire after a certain amount of time - be it hours, days, weeks, or months. 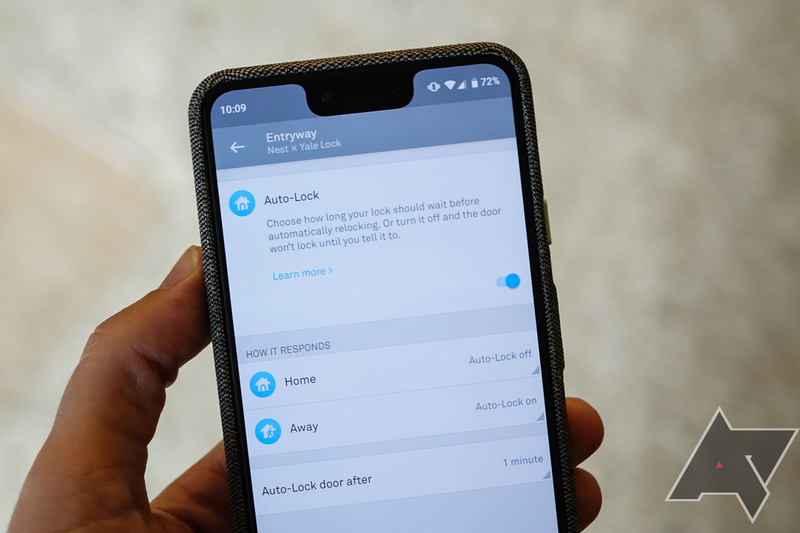 You can activate a kind of "do not disturb" mode on the lock that completely deactivates the exterior keypad, only allowing entry via the smartphone app. The lock can be set to automatically engage when Nest detects that you're away from home. And if you have a Nest Secure, you can link the two - your Nest Secure code and your door lock code become shared, and entering that code on the keypad of the lock will also disarm your alarm. Oh, and you can lock (but not unlock, because security) the door via voice command. You can also ask Google if the door is locked. While all the thoughtful features are nice and the setup is easy to get going, there are some practical downsides. For one, the battery life of the lock is rated at one year. If it dies - and it will warn you many times before it does - and you get locked out, you'll have to use a 9V battery on a set of jumper leads on the bottom of the lock that will provide enough juice to activate the keypad so you can unlock the door. It's clever, but it shows the pitfalls of relying on old-school battery tech. And in order to make sure your kids don't lock you out of your home by yanking the batteries, you need to use a small metal tool to open the battery compartment (a paper clip probably works just as well in a pinch). It's yet another thoughtful measure, but one that can't help but illustrate yet another shortcoming. As for the question of "what happens if the lock itself breaks?" I thought about this, and for a moment, realized that would be a huge, massive problem. It would have to be drilled out if I couldn't get back inside, which would mean hiring a locksmith and parting with several hundred dollars. But as a Reddit thread pointed out, that's just as true of an analog lock, which are also prone to failure. And with a smart lock, as long as you know your entry code, you'll never lose a key or lock it inside the house - making a visit from the locksmith far less likely in the first place. The issues really do kind of start and end there, though, as this is a surprisingly complete product. And it's secure: Nest products communicate over the Thread protocol, an open standard for IoT devices developed by Google, which operates as a mesh network separate from your home's Wi-Fi. "Router" devices like the Nest Connect or Nest Guard communicate with the lock over an encrypted connection, so (in theory) nothing is exposed to the internet or even other devices on your network. 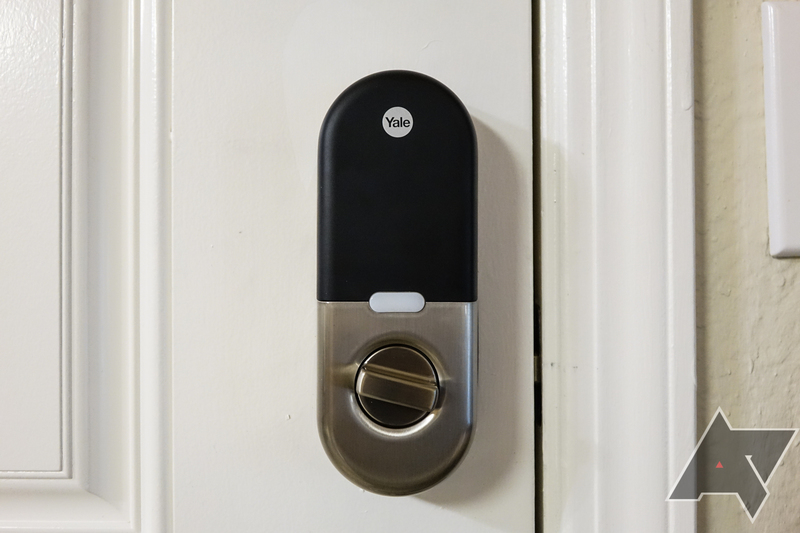 As opposed to other smart locks that can work over Bluetooth or NFC, the Nest x Yale's approach to security does give up some minor convenience - your phone and the lock need an internet connection for remote operation, and the lock only works remotely via Nest's proprietary communication protocol - to completely shut out two (very big) potential attack vectors. Reading all this, you might think that a smart door lock comes with compromises, and it certainly does. The same is true of any smart home gadget, especially one that requires batteries. But the convenience of this product is impossible to argue, and it makes managing access to your home incredibly easy - the hour-limited and expiring guest codes alone are complete game changers. And not carrying around my house keys is oddly freeing. 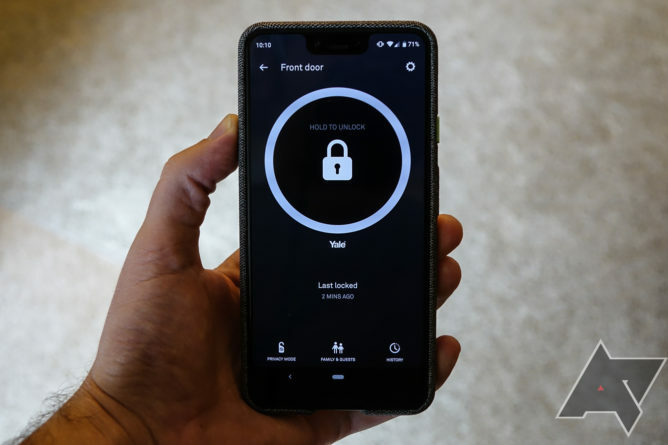 For the skeptics, there will be nits to pick at in any smart home gadget, but for those of us who don't subscribe to Home Security Enthusiast Quarterly, a smart door lock just makes too much sense to ignore at this point. Having only used the Nest x Yale, I can't provide other points of comparison, but this one seems pretty great, though others probably make more sense for those who don't want to get tangled up in the Nest ecosystem (August's Smart Lock Pro seems like a popular option, and it does work with a lot of stuff). Either way, a smart door lock is something I think should be on your radar at this point, provided it meets you and your door's needs.